After a stellar career in the late 1980s and early '90s as a member of the socio-politically conscious hip-hop group Public Enemy, Flavor "William Jonathan Drayton, Jr." Flav has been on a mission to slowly destroy all that he and Public Enemy frontman, Chuck D, helped build. His work is finally paying off. With the opening of a fried chicken restaurant and new line of alcoholic beverages, Flav earned the attention of the Ku Klux Klan, who intend to make him the first African-American recipient of its coveted KKK Image Award. 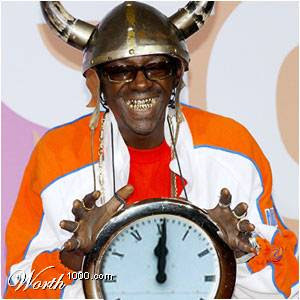 When informed of the news, Flav was overheard excitedly shouting "Yeah!" to what is believed to be his son. "Now, we normally tend to steer clear from his kind," company spokesman Franklin Watson angrily murmured, "but Mr. Flavor's achievements in the field of colored dislikeability can no longer be ignored. Quite honestly, this is long overdue." Watson made numerous references to Flav's appearances in VH1 reality shows The Surreal Life and Strange Love, and believes that while miscegenation is never a good thing, nothing proved that more than those programs. Watson also expressed great adulation for the Flavor of Love series, because his role as a fear/hate-monger had never been so easy. "I mean, did you ever watch that show?" he asked. "I mean, really watch it?" Surprisingly, Watson had no comment about Flavor Flav's work in the short-lived, MyNetworkTV sitcom Under One Roof as he had never heard of it. When asked if he would be attending the ceremony with his former bandmate, Chuck D wrapped himself with a warm blanket and gently sobbed until he fell asleep.